Latvians have begun voting in elections that are expected to reflect anger at the government's tough austerity measures in the Baltic state. The vote could determine the country's commitment to its international loan agreements and plans to adopt the euro. Opinion polls show strong support for an opposition party representing the Russian-speaking minority. 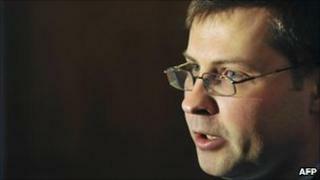 But the polls also suggest that the government of Prime Minister Valdis Dombrovskis could return to power. Frustration with budget cuts and tax increases could help the pro-Russian party Harmony Centre to win seats in parliament for the first time since Latvia's independence from the former Soviet Union in 1990. Presenting itself as a social-democratic alternative, it hopes to benefit from widespread anger at the austerity measures of the centre-right coalition under Mr Dombrovskis. Since 2008 Latvia has endured one of the worst recessions in the European Union. Official figures show that unemployment is still 20%, and the BBC's Damien McGuiness in Riga says the austerity measures have cut wages by up to 50%. But the government's policies have impressed international lenders and the economy is more stable, our correspondent says. Investors see Mr Dombrovskis as the main guarantor of an austerity deal that included a 7.5bn euros ($10bn) bailout led by the International Monetary Fund and the EU. Mr Dombrovskis, who is also aiming to adopt the euro as the national currency in 2014, took over as prime minister when the crisis was at its worst in 2009.